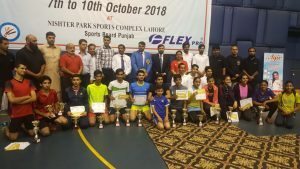 Punjab Junior Badminton Championship concluded at Nishtar Park Sports Complex Lahore. The National Championship will be now commence 11th October 2018. The final of Women’s Singles U-18 category was played between Lahore’s Laiba Masood and Amal Munib while Raja Zulqarnain Haider (Hafizbad) and Muqsit Amir (Faislabad) were the finallists in the Men’s U-18 Singles category. Raja Zulqarnain Haider (Hafizbad) won the Boys Singles U-18 while Lahore’s Amal Munib got the girls single U -18 crown. The boys U -14 singles title goes to Saad Amir of Lahore. In the boys U-16 singles Raza Ali Adil of Lahore took the title whereas in the girls singles U-16 Zainab Chaudhry of Lahore and in the boys doubles U-18 Raja Zulqarnain & Tayyab Shafiq of Lahore remained triumphant.